A line from the University’s Wabash building extended all the way around the sidewalk to the Auditorium building. The new student convocation ceremony, meant to celebrate the future achievements of the new students and faculty was especially symbolic this year. This incoming freshman class had one notable difference than the classes before them – the introduction of President Ali Malekzadeh – who was also starting his first year with RU. With the class of 2019 and Malekzadeh starting at the same time, they have a strong connection. “A lot of things have changed, so it’s very exciting. It’s a new year, and our new students have a new president,” said Chicago College of Performing Arts (CCPA) professor Scott Mason, pointing out the period of transition the University will experience under a new presidency. The RU faculty led the way into the Auditorium Theatre for the students, both groups clad in tee shirts that read the University’s slogan, “Be Brave. Be Bold. 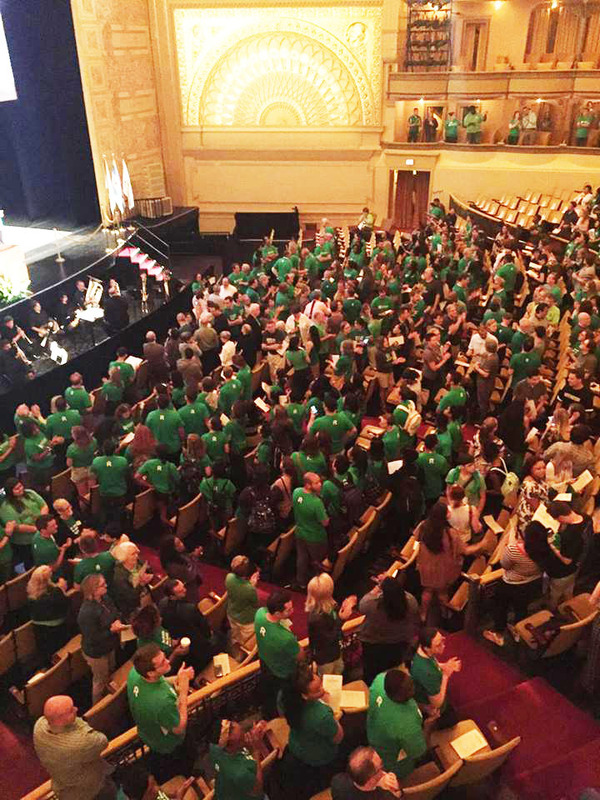 Begin.” As they filed into the building, the venue was filled with a sea of the green RU shirts. The ceremony gave some students nostalgic feelings of starting high school. After formally welcoming the new students, the fresh-faced students were given a chance to become familiar with the diverse professors that filled the different faculties within the University. The University’s staff welcomed new additions to the faculty. Eighty-nine new faculty and staff were added in the 2015-2016 school year, 21 of whom were professors. Malekzadeh is eager to build relationships with the new students. Most of his speech was dedicated to motivating the new students in pursuit of their academic goals. At the convocation, President Malekzadeh urged students to use the tools at their disposal. He cited several different programs including the RU faculty as a necessary resource that students needed to take more advantage of. This is a sentiment that he had previously talked about in length when he met students and faculty for the first time during his candidacy in the Spring semester of 2015. During that time he spoke about college students dropping out due to a number of problems that included money, unpreparedness and loss of motivation after a poor semester. President Malekzadeh made sure that the students knew their priorities coming into the University setting. He stressed that they should make the most of their college experience, but to always keep in mind that the graduation date is what they should always remain focused on.Determined for a successful presidential term, he started the year by vowing to lend all his efforts into the success of his new freshman class.